THE DIRTY ARMY: My fiancé and I offered to let Dakota stay with us and join our new start up at a 5% ownership because he complained he lived on his sisters couch and babysat her four hellions while she was busy doing drugs. Before we’d even signed the paperwork we found out his nut bag of a sister had posted missing posters all over social media because he moved out and refused to contact her. Needless to say we told him to get his family life in order before he could join our company. Then I found out he was tellin people I was a wacko who forced him to live with us, eat our food, smoke our cigarettes, and sleep on our couch. That was the final straw and we decided not to make Dakota a partner. That’s when the threats started, first he threatened to have my animals killed. Then he told me to “pay up and it all goes away” then he threatened to show up st my door if I didn’t pay him the unspecified amount of money. I called the cops, but all they did was ask him to stop contacting me. 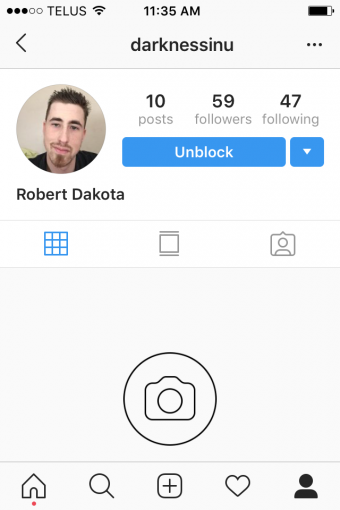 People in Nanaimo need to know about this creep before he actaually manages to hurt someone for real. Cops won’t help maybe you can. Gotta admit OP, that picture alone screamed weirdo. Don’t be a hero. You’d think his handle “darknessinu” would be a dead give away?!! !